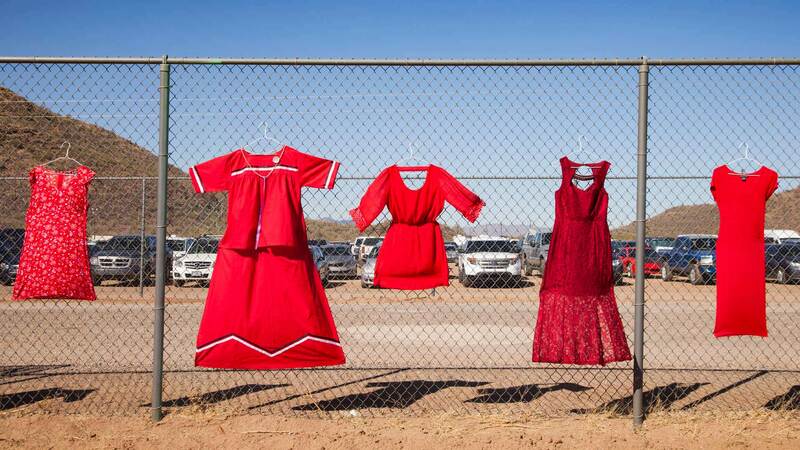 / Modified sep 5, 2018 1:15 p.m.
Red dresses representing missing and murdered indigenous women, displayed at the Verna N. Enos Toka Field on the Tohono O'odham Nation, 2018. In the past decade, Congress responded to the problem of violence against Native American women with intensely debated legislation seeking to close legal loopholes, improve data collection and increase funding for training of tribal police. Those efforts have proven severely limited, however, prompting advocates to again push for more reforms. "I think the reason that Native women may go missing at higher rates than other groups of people is very similar to the reason that they are at higher risk for domestic violence and sexual assault," said Sarah Deer, a University of Kansas professor, member of the Muscogee (Creek) Nation and author of a book on sexual violence in Indian Country. "The legal system is simply not functioning properly [to prevent] these types of things from happening." That program was one of many crime-fighting measures in the Tribal Law and Order Act of 2010 , which gave tribes authority to hand down longer sentences while mandating that federal officials do more to train tribal police on evidence collection and provide an annual report on Indian Country crime statistics. Years later, those data collection and reporting efforts are still in development, funding for law enforcement training remains limited and the Justice Department's assistance with public safety on reservations — a role referenced in multiple treaties with tribes — has fallen short of officials' expressed commitment to Indian Country, according to the Justice Department's Office of the Inspector General. "The legal system is simply not functioning properly [to prevent] these types of things from happening." In a 2017 report report, the Inspector General also highlighted U.S. attorneys' uneven track record with prosecuting serious violent crimes on reservations, citing data that must be collected under the 2010 law to help improve those prosecution rates. Before the law, the U.S. Government Accountability Office found, U.S. attorneys declined to prosecute half of cases on reservations, leading to concerns that the practice was creating a safe haven for criminals on tribal lands. The latest figures from 2016 show U.S. attorneys declined to prosecute 46 percent of reservation cases, marking only marginal improvement. That included rejecting more than 550 assault and sexual assault cases — more than any other type of crime. (Domestic violence cases typically fall under assault.) Prosecutors blamed the vast majority of rejections on insufficient evidence. In Alaska, state authorities — who handle criminal investigations in more than 200 Alaska Native villages — have been accused of classifying fatalities as suicides when families feel certain their loved ones died from a homicide, according to representatives from the Akiak, Emmonak and Tetlin communities. The state, which has the highest percentage of Native residents percentage of Native residents in the U.S., also has some of the biggest crime disparities in the nation, including the highest rate rate of women murdered by men. AP data journalist Angeliki Kastanis contributed to this story in Los Angeles.